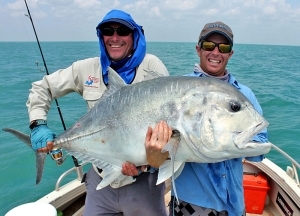 The GT is the biggest and toughest member of the trevally family. They are common and attain a weight in excess of 40kg although most captured are in the 2 to 10kg range. One of the hardest tropical fighting fish, the GT will test any angler and any tackle. There can be few better tropical fishing experiences than seeing a big giant trevally slam a fast-retrieved surface lure but these strikes are usually followed by a crash dive for the seabed, where lines can be severed on the reef outcrops which attract and hold these stubborn fighting fish. GT will tend to stick together even when one is hooked, so if you have a fish on, others are likely to be swimming with it – get another lure out fast! Other Names: Caranx ignobilis. Turrum, great trevally, GT, Trevor. Location: Reefs and rocky headlands and clear estuary mouths. Method: Standard light-game fishing tackle in the 6 kg to 15 kg range. The fish are sometimes taken on bottom baits but lures trolled or cast around shallow reefs rising out of deeper water produce good fishing. When they are around, the most exciting fishing is with fast retrieve surface lures and loud bloopers. Eating: Although local anglers consider trevally to be poor eating, the flesh of smaller fish up to about 6 kg is white, firm, slightly dry and actually has a pleasant flavour. The flesh of larger fish is usually very dry. Trevally are best eaten on the day of capture. Locals use trevally or queenfish to make a snack dish called numus – dice the raw flesh, add sliced onions and steep it in a mixture of vinegar, lemon juice and chilli. If you like a bit more tang, try numus with a little wasabi paste.